I have written previously about the dark and miserable era that followed the fall of Rome, starting in the 5th Century. Here’s another: Europe in the 14th Century. In 1978, the historian Barbara Tuchman, who won a Pulitzer for her history of World War I, published a book that also became a best-seller: A Distant Mirror: The Calamitous 14th Century. This book caused quite a stir when it was first published, and I had long meant to read it. I finally did, after I found a copy of it in a junk store in Madison for 75 cents. Centuries before, the ideal of chivalry had provided a little light in the darkness of the Middle Ages. But by the 14th Century, chivalry had fallen into decadence. The nobility lived as parasites off the labor of the peasantry and gave nothing to speak of in return. War and extravagant consumption, it seems, were all the nobility lived for. Wars went on and on from their own inertia, though no one even remembered what they were fighting for. The church too, in centuries past, had preserved a tiny light of order and learning in the darkness of the Middle Ages, but by the 14th Century the church was as decadent and corrupt and parasitic as the nobility. Everything was for sale: the sacraments, annulments, dispensations, pardons, offices, emoluments. The church also was torn by schism. There were two popes, one in Rome and one in Avignon. Torture and Inquisition were highly refined and ruthlessly practiced. The peasantry was miserably poor, lived in filthy hovels, was racked with disease and saddled with crushing taxes. Up to two-thirds of their children did not live to be adults. Several times during the century, there were peasant revolts. But always those revolts were put down as quickly as the nobles could rally enough men on horseback to cut the peasants down. 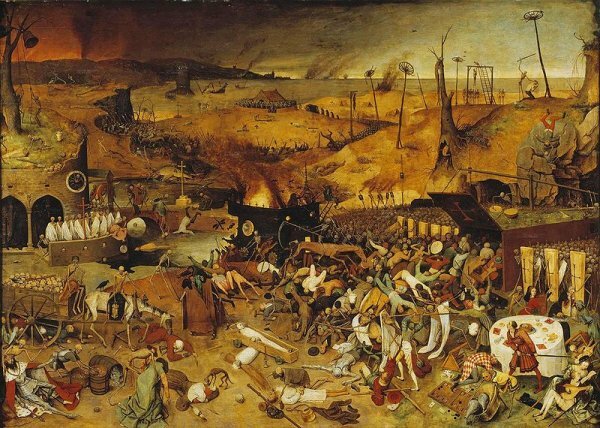 And if that wasn’t enough, there was the Black Death, which killed up to 60 percent of Europe’s population. There were no longer enough people to till the fields, further increasing the misery for those who survived the plague. By 1415, French chivalry was in ruins, with thousands of nobles dead in the mud at the Battle of Agincourt. Those ruins of the fortresses and abbeys of the Middle Ages that we see today: Much of that was not the result of centuries of gradual decay. Rather, it was destruction caused by the wars, raiding and pillaging of the 14th Century. A saint was born out of this ruin: Joan of Arc. Why is this relevant to a relocalization blog? Because human nature doesn’t change. We would do well to not forget how thin is the veneer of civilizaton, or how fragile the rule of law. No matter what the cost of war, we humans never seem to learn. Elites, glorifying war, have the same tendency to become ever richer and to make ever greater wagers to increase their wealth and power. Again and again we find that the times of greatest luxury for elites are the times of greatest hardship for those who actually do the work. A Distant Mirror: The Calamitous 14th Century. Barbara W. Tuchman. Alfred A. Knopf, New York, 1978. 720 pages. This was written by daltoni. Posted on Tuesday, March 9, 2010, at 5:11 pm. Filed under Culture, Relocalization, Sustainable living. Bookmark the permalink. Follow comments here with the RSS feed. Post a comment or leave a trackback. I agree that history repeats itself, and that most of the world seems to function as if ignorant of this fact — to the the detriment of its populace. I also agree with what appears to be a theme among your most recent posts that we as a nation and a world are racing toward the next great social and economic collapse. The glimmer of hope out of all the misery of our history and the signs of our present is that after each such cataclysmic collapse there arises a more advanced culture. Perhaps the human race, in its desire for a semblance of stability, lacks the will to bring about significant social changes without the crisis of the collapse of existing norms. Perhaps it all boils down to Necessity truly being the mother of Invention. It took centuries to duplicate the civil technologies of Rome after its collapse. But when the Renaissance finally did blossom in the 15th century, we eventually embarked on an age of humanism and reason that led to the end of the divine rights of monarchs, the Industrial Revolution, and setting foot on the moon — and new problems. The most shameful lesson of history is that we seem incapable of avoiding the many atrocities we commit against one another prior to evolving to the point that we can achieve another “giant leap” along the path of progress. Let’s just hope that civilization’s next phoenix does not take a millenium to gestate. I have a friend in Asheville whom I just had a conversation with regarding how human nature completely collapsed in New Orleans after Katrina hit. All the looting and crime that took over rather than the community coming together and helping each other make it through with their values still intact. He was wondering what it is that pushes the human race to constantly turn on each other rather than coming together?